MORE mushrooms from backyard. FRESH this time. Okay here they are. 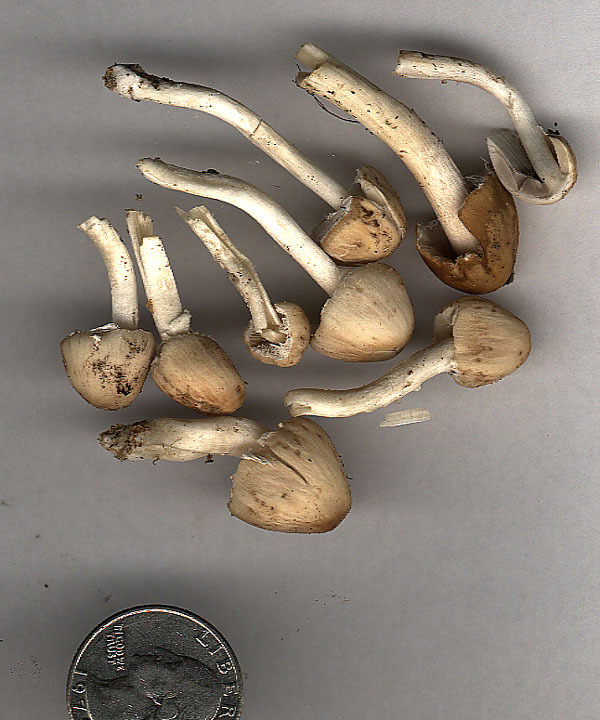 The shrooms in the first photo appear to be the same as the dry ones I posted earlier. They were pulled from my lawn. We ran the sprinklers last night. We also use a mulching mower. This next group is a variety of shrooms I found from all over the yard. The one in the upper right was found on his own in the lawn. The dry one just below him was found in bark all alone. The group of 3 white ones were found together in the lawn near a tree stump. The last one with the cool pattern on top was found in the lawn near the base of a tree. 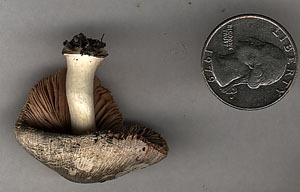 The last picture is just a top and bottom view of this same mushroom. So what's the word? Any of this look like psychoactive shrooms? Or poisionous ones? These were found in UT. I've bruised them all and looked for blueing, but it's only been about 20 min since I bruised them. The white ones look like they are bruising, but it looks gray right now. They all have gills. nothing magic. sorry again for getting your hopes up. Well they look cool anyway. Here are some more I found just a few minutes ago. Just for my knowledge...What (other than blueing) tips you off that these are not psychoactive? Do you know of any place I could find out what magic mushrooms grow in Utah..names of mushroom, description, season, photos? I'm trying to absorb as much info as possible before deciding how to accomodate my shrooming needs. I would like to hunt for them, but if that's simply not feasible in UT. I'll consider growing. Did you take sporeprints? That would REALLY help narrow it down. But I'll take a shot in the dark at these anyway. 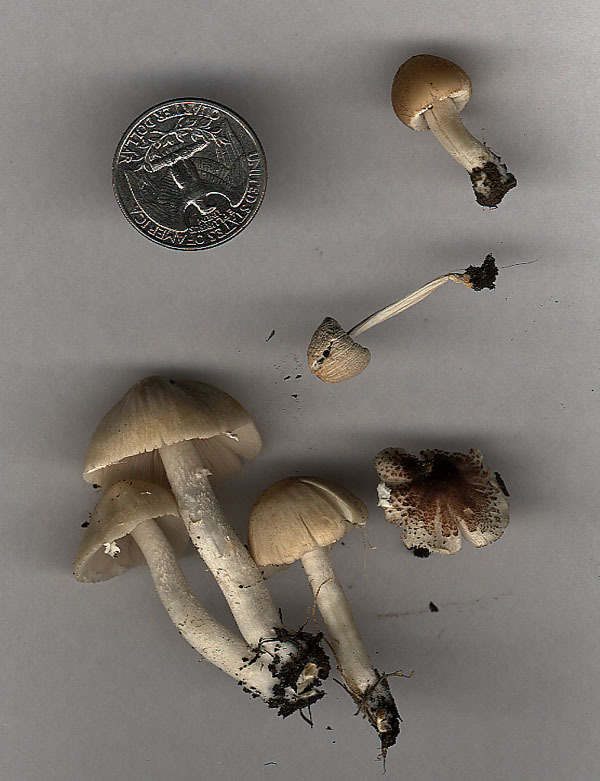 The ones in photo #1 do look like some kind of Panaeolus: if the spores are black, then that's what they are. Harmless, but probably useless. Dark brown or purplish-brown spores would place them in Panaeolina, also harmless-but-useless. Most of those in Photo #2 look like Psathryella (candoleana?) Dark purplish-brown spores would confirm. Harmless but useless. 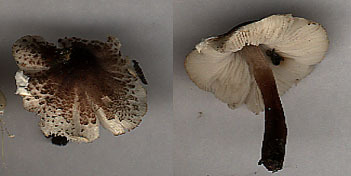 The light-gilled scaly-capped specimens in Photos # 2 & 3 might be poisonous--some species of Lepiota (if the spores are white) or Inocybe (if spores are light brown). The ones in your later post look like more Psathryellas. I really don't know anything about what grows in Utah (besides Mormons & sheep)--have only passed thru the state a couple of times, as quickly as possible--but I've never heard of any magical fungi growing there. Probably some good edibles up in the mountains, but if you want to journey with Lord Teotacanatl, then home-growing is probably your best bet. Thanks for the reply. I just figured I should see whats growing in my own backyard before I set out on either an expedition to find them or shopping spree to start growing them. 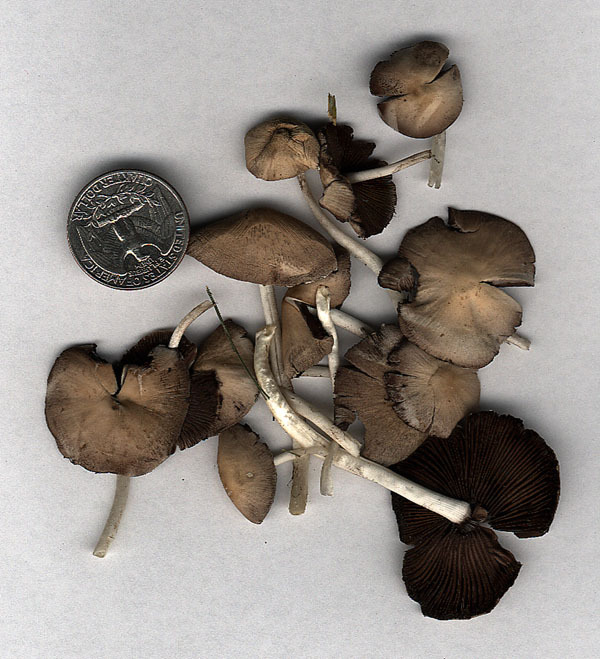 "Black spored fungi of the genus Panaeolus and Copelandia species both belong to the family of psilocybian fungi known to contain the hallucinogenic indole alkaloids psilocybin and psilocin. 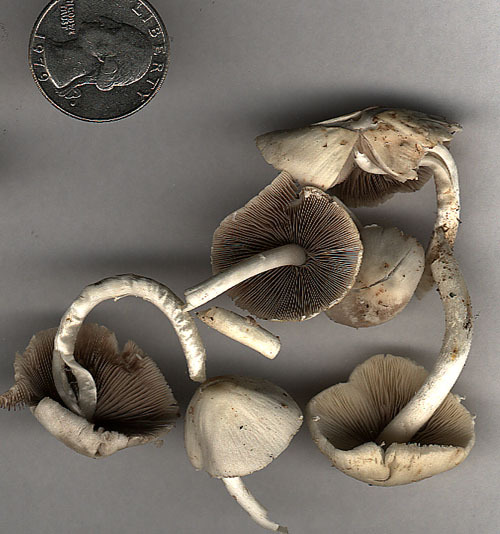 Black-spored fungi of the genus Coprinus and Anellaria may contain some tryptamine derivatives but do not possess either psilocin or psilocybin. " Any arguments for or against. I'm still completely new at this and any positions one way or the other won't offend me in the slightest. I may be totally wrong and I don't mind being wrong so long as I can learn why I'm wrong. 1,553 topic views. 11 members, 38 guests and 8 web crawlers are browsing this forum.